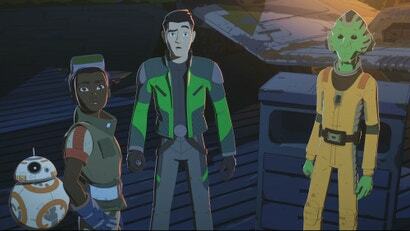 Unlike Lucasfilm's other animated series, The Clone Wars and Rebels, Resistance is the first show to take place after Return of the Jedi. It begins about six months before the events of The Force Awakens, which really set the tone for everything Resistance would become. "We knew, 'OK, these things happen,'" Ridge told Gizmodo over the phone last month. "So what are some of the events that could lead up to it?" The events that lead up to it start with Poe Dameron meeting a young, brash pilot named Kaz Xiono and recruiting him to help the Resistance with a secret mission on a faraway planet. It's a planet filled with all kinds of people — good, bad, alien, droid, and more — but, because of its place in the overall story, there are no Jedi. "We wanted to give a slice of life in a part of the galaxy that wasn't about the Jedi," Ridge said. "How do people who are maybe not as connected with the Force, or at least they don't think they are, how did they respond to these threats? What do we do in the meantime when there isn't really a war going on?" "I'm really excited about this time period because it's kind of an interesting hybrid," Ridge said. "You have some of the old tech, the old ships that you see on Clone Wars and the original trilogy, but now you're also going into this new time period. So it's kind of neat to see who is holding on to old remnants from the old movies and then going into the new. It's a cool hybrid to deal with all of that." Not everything is a mix between the eras, though. 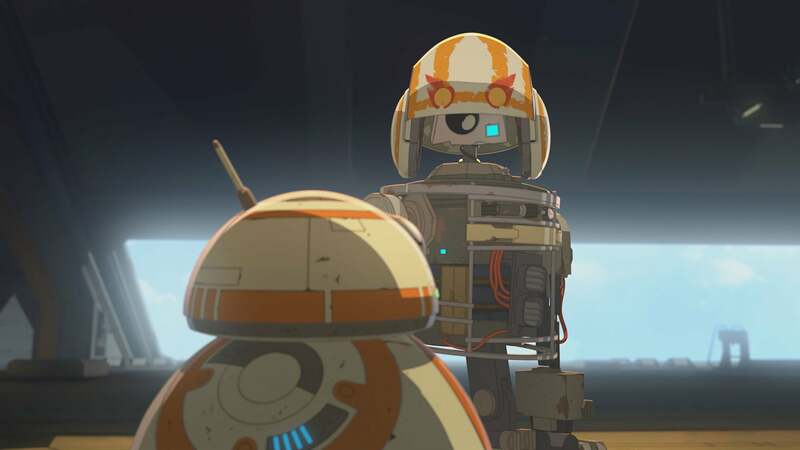 Ridge and his team thought it was important to have some very recognisable connections to the new Star Wars movies, and that's why Poe Dameron and Captain Phasma will appear on the show. "We knew we needed to have some things overlap a little bit with the new movies in order for people to understand the time period that this takes place," Ridge said. "And to really feel like 'Oh, this is Star Wars, it's just happening in a different location than we've seen before.'" 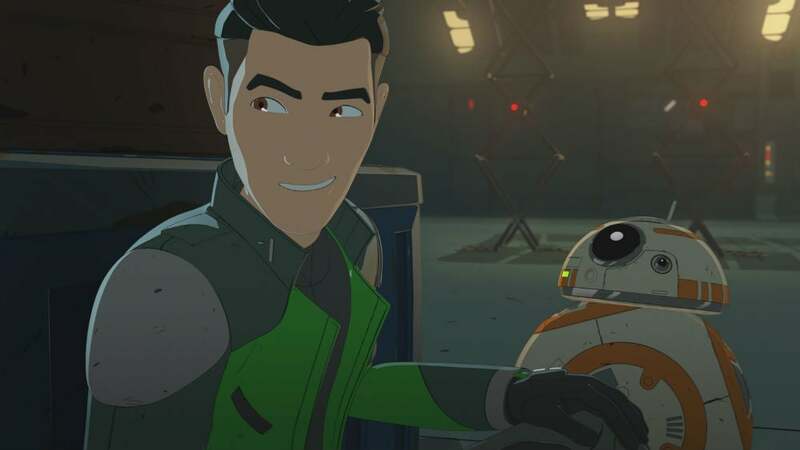 Beyond those two characters, just how connected Resistance will be to Star Wars at large is still a mystery. Given its title, it seems likely we'll learn not just more about the Resistance before (and perhaps even during and after) The Force Awakens, but the First Order as well. That means, hypothetically, we could learn more about Kylo Ren, Supreme Leader Snoke, and many others. However, Ridge was very quick to explain that while anything is possible, they would only bring in movie characters if the situation called for it. "The main focus is really Kaz and his family here on the station, which [is] a Jedi-free environment," Ridge said "And if there are characters it makes sense to overlap or maybe they come through the Colossus then we'll try to see how we can make that believable. [But] it's not our M.O. to try and fit in existing characters from the movies or the novels." Whether or not characters from the First Order, Aftermath novels, or anything else appear, we do know Kaz starts Resistance with a very specific mission. Logically, at some point, he's likely to complete that mission. The question is will that be a multiple season story or just the start of something larger? Ridge wouldn't say for sure but his cryptic answer seemed to suggest this was just the beginning. "We have lots of story in mind so the hope is to continue past as the first season," Ridge answered. "The hope is always to have several seasons to tell the stories." Just don't expect those stories to get as dark as the movies. Star Wars Resistance is, by design, a show aimed at younger audiences. But Ridge stresses balancing that with Star Wars of the past is one of their biggest challenges. "It's our priority to make sure we're respectful to Star Wars and the stories that led up to it," Ridge said. "We don't want to deviate away from what we've done before but we definitely want this to be more accessible for kids, young fans, and old fans alike. it's definitely a balance we're very aware of all the time." And thus highlighting the reason the Star Wars universe will never be able to expand. The best Star Wars stories have minimal Jedi or Force involvement. I get that there is more to Star Wars than lightsabers and force choking, but really the franchise was initiated to tell the story of a Jedi and the force being reestablished in a large universe. 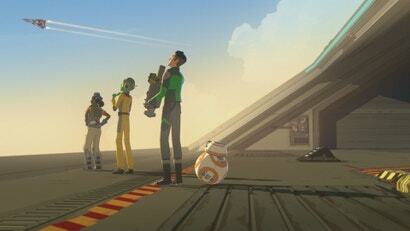 Yes, there are side stories of pilots and so forth, but I’m old enough to know what excited me about the franchise, and it isn’t BB8, a dude called Kaz and focus tested crew created to sell more toys.